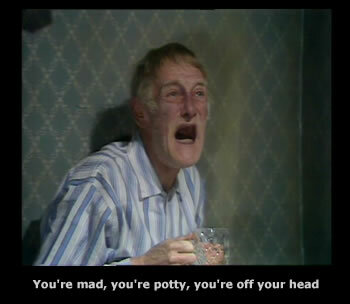 The episode starts with him being beaten again by Albert this time at badminton in the yard with his father taunting him that he’s a “scrub out” and threatens to do the same to him at the local tennis club he has just joined. Harold in no uncertain terms warns him not to go near …. Later on Harold asleep in bed has a nightmare of his father beating him at everything that they play together and finally sleepwalks to the kitchen for a meat clever and enters his father’s bedroom and tries to do a “Lizzie Borden” on him. Albert luckily awakes in time. The next sequence sees Harold talking to a psychiatrist trying to explain and understand why he would want to kill his father. Harold recounts the tale of his latest failed love affair with Bunty played by the lovely Joanna Lumley and his father’s part in it. Why does the Shrink want to know the size of his mother’s bristols? And how will he take the news of Albert having joined the local tennis club? Harold again loses to albert no matter how seriously he plays!!! Now all this losing to Albert seems to be playing on Harolds mind and gets him down so much that he starts dreaming about the situation. 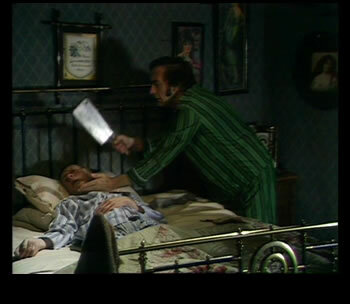 Harold starts sleepwalking and tries to chop off his dads head with a meat cleaver. Tragedy averted because Albert wakes up startled, and throws water over Harold, "you're mad, you're potty, you're off your head" screams Albert. A trip to the phyciatrist is the only way out for Harold. Does the phyciatrist take Harold seriously? Does the phyciatrist have an artistic talent? And would you have eaten the cucumber sandwich? Just don't ask Albert to iron your trousers! Just how does Harold get to go back home? Buy this DVD and howl with laughter at Albert' recation to his near death experiance.